Well, I DID warn you I wouldn’t be giving up my stripes anytime soon, and here’s the proof! 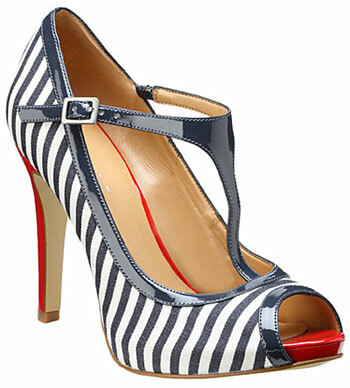 These are Nine West’s ‘Eastbound’ pumps, and they could almost have been made with my summer wardrobe in mind: the blue/red/white mix will work perfectly with all of those nautical pieces floating around at the moment (and which dominated last summer, too), and they have a fresh, carefree look to them which I love. I like the shape of these as well as the colour, although I’m not quite as keen on the other versions which are available, namely black leather, black studded satin and blue studded satin. 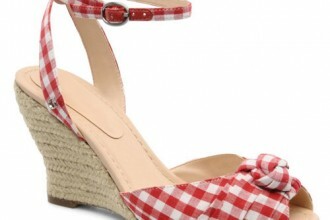 These are $89, and you can buy them at NineWest.com. Gorgeous! I hope you’re getting a pair. I would buy them – and then cut off the t-bar. These are featured in the new issue of More magazine and they look soooooooo cute. If I saw a pic of just the shoes I wouldn’t like them but to see them on some feet they look really good.